Other improvements include filling more of a user's view and automatically recognising who they are. The previous version of HoloLens was mainly targeted at developers. A rival AR headset-maker - Magic Leap - similarly markets its gear to software developers and other early adopters. "Immersion, or persuading the wearer that they really are part of the scene they see in front of them, is important," commented Paul Miller from Forrester. "The relatively narrow field-of-view for the first generation HoloLens made it difficult for wearers to suspend disbelief and accept that they were immersed in the environment before their eyes. "With HoloLens 2, Microsoft has worked hard to improve both the resolution of the display and its field-of-view, resulting in a more immersive and believable experience." "We did not sign up to develop weapons, and we demand a say in how our work is used," it said. 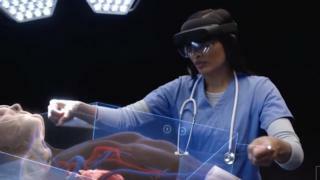 Microsoft said that HoloLens 2 works in a "more human way" than the first version thanks to the changes it has made. Many users had expressed disappointment at how small a window graphics had been contained to, meaning that their experience had fallen short of what Microsoft's promotional videos had suggested. The firm said it had also improved the display's resolution, which it described as being the equivalent of moving from a 720p high-definition image to a 2K one for each eye. The company also acknowledged that some users of the original version had found it uncomfortable to wear for lengthy periods. It said a revamped fitting system should mean the kit now felt as if it was "floating" on workers' heads. 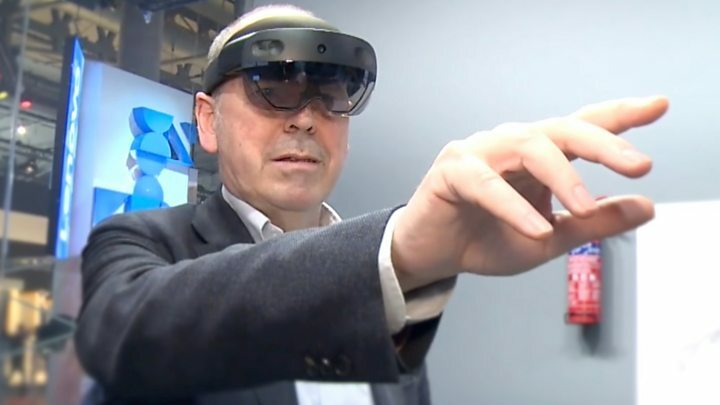 "The jury is still firmly out on whether companies can be convinced to go all in on HoloLens, but if there is one company that can do it, it is probably Microsoft," commented Nick McQuire from CCS Insight. "While improving the security and design will be major pluses, Microsoft will need to ensure there are durable and rugged models from partners for industrial applications and that it works well on a range of wi-fi signals for it to have mass appeal and overcome previous problems. "In time, we would expect a 5G HoloLens model will arrive as well."